In your own words discuss the benefits of normalization. Do you think we should normalize our designs to higher levels than 3NF? Why or why not? There are 14 physical database design techniques discussed in chapter 8. The goal of a quality physical design is to improve performance while disrupting the logical design as little as possible. Pick a technique, which you believe to be the most beneficial in accomplishing the above goal, and explain your reasoning. Discuss the concept of an index and explain how they improve performance. 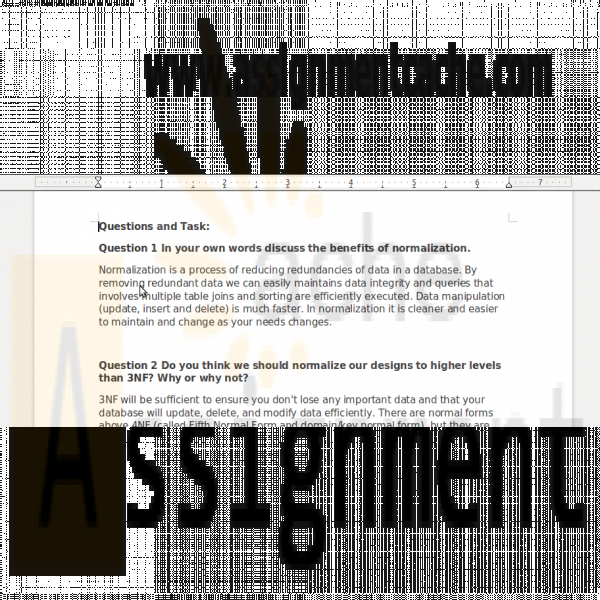 Assignment "Final Project Overview" You just took a job with a University and have been asked to track some information about the courses they offer. The previous employee was using a spreadsheet to track this information. The University is expanding from three classes to three hundred classes. Enrollment is expected to increase from around 20 students to 5,000. Your supervisors are not very tech savvy and they simply ask you to continue maintaining the spreadsheet. Review the spreadsheet labeled final_project.xlsx. Explain the issues that exist with maintaining the data in its current form. Explain the benefits of the data in its new form. Create the E-R diagram of your relational tables using MySQL Workbench. Provide the SQL statement required to create at least one of your tables. Provide the SQL statement required to delete at least one of your tables. 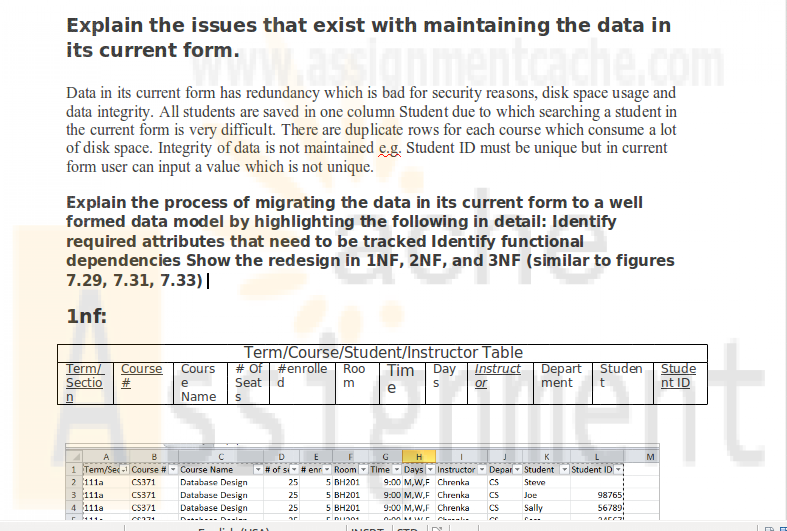 Provide the SQL statement required to create a view which includes Course #, Course Name, Time, and Days only. Identify at least one index, which you believe would improve performance. Propose some additional data items, which you believe may be beneficial to the University if tracked in your database (i.e. Descriptions, more info about the instructors and students, departments, etc). Describe the steps required to implement these additions. If you add a course description attribute to your course table, there may be some performance impacts imposed by the addition of this text field. Discuss a physical design technique to improve the performance of the new course description field.